​The county's business community has presented Professor Tim Wheeler with a prestigious accolade, to acknowledge the impact which his leadership of the University of Chester and its precursors since 1998 has had on the area's economy. On Friday (October 6) he received the 'Business Person of the Year' title at the Cheshire Business Awards 2017, hosted by Trinity Mirror Cheshire and sponsored by SAS Daniels LLP. Here's what the citation said: "Our Business Person of the Year for 2017 was educated at the University College of North Wales, Bangor, where he studied as an undergraduate and subsequently gained a Doctorate in Psychology. During his career, he has held posts at universities in England, Ireland and Scotland. Much of his work has involved academic and industrial consultancies across three continents. "Our winner has published more than 120 articles, books and research reports in a diverse range of areas including psychopharmacology, dyslexia, communications and safety. 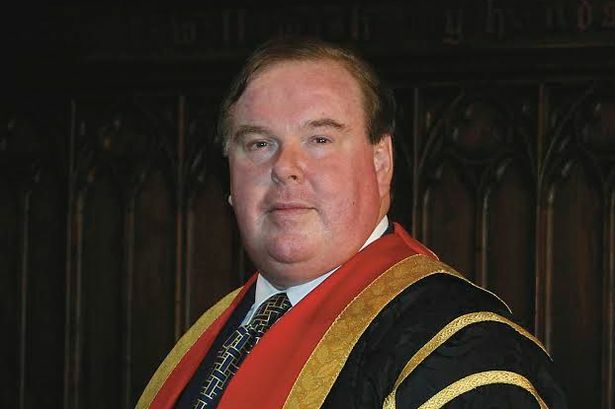 "When he was appointed Principal of University College Chester in 1998, it was a highly respected, well established provider of higher education in Chester, but was somewhat in the shadow of the University of Liverpool and was essentially contained within its original site in Cheyney Road. "Just seven years later, under his inspirational leadership, the University of Chester came into being and our winner became its first Vice-Chancellor, a role he has since used for the benefit of the University itself and the wider economy of the area. Just last month we learned that the popular University has risen 20 places – one of the biggest leaps in the country - in the Times and Sunday Time Good University Guide. This year, it has also earned a 'Best University in the North West for Academic Excellence' title in the Times Higher Education Student Experience Survey. It produces research which is deemed 'internationally excellent,' with a significant proportion judged as 'world leading' in the UK's latest national assessment. "During his time as Vice-Chancellor, the University has expanded and developed beyond anyone's wildest dreams over its 178 year history. He has established campuses at Kingsway, Riverside and Queen's Park in Chester, in Warrington. Most recently, he assumed responsibility for the Shell Technology Centre in Thornton, to create the Thornton Science Park, directly addressing national skills gaps by offering students the country's first new engineering faculty for two decades, alongside innovative and growing businesses in the energy, environmental, automotive and advanced manufacturing sectors as a key component of the Cheshire Science Corridor Enterprise Zone and wider Northern Powerhouse. In addition, he has been pivotal in establishing a pioneering new higher education institution, in partnership with Shropshire Council. Throughout his tenure, he has remained true to the University's mission in educating an employment-ready workforce, which makes a real contribution to society, including most of Cheshire's police officers, teachers, nurses, midwives and social workers. Before they graduate, he encourages them to put something back into the community, which annually amounts to at least 33,000 volunteering hours and tens of thousands of pounds worth of fundraising. "An economic impact assessment report, commissioned in 2012, revealed the University's contribution of over £298 million, which, on the next independent assessment rose to £386 million in 2015. This figure is now estimated to be well in excess of £400 million. Over 20,000 students of all ages and from all over the world are enrolled onto the University's programmes, more than double the number from when he first arrived, and the University provides regional employment for around 1,600 staff and countless suppliers and contractors. "Formerly Deputy Chair of the Universities and Colleges Admissions Service (UCAS), the person in question was an executive member of the North West Regional Assembly and Chair of the North West Universities' Association and sits on the Cheshire and Warrington Local Enterprise Partnership. He is a Deputy Lieutenant for Cheshire and is actively involved with Chester Cathedral. "While a strategic prime-mover on the national and global stage, he manages to maintain meticulous attention to detail in operational matters closer to home. "Our winner is demonstrates outstanding achievement and inspires others around him. "He has been instrumental to the success of the University, growing the reputation of both the University of Chester and the wider region.